Today started off with information around Forefront Online Protection for Exchange. It now has the ability to not only view information but also make changes including things like white listing and creating email signatures. This will be quite handy and makes things more flexible than they currently are. In Australia there will be an Office365 ‘P’ SKU which is aimed at small business and most likely designed to work with SBS 2011 Essentials. Personally, I can’t see myself ever recommending that option for customers.Why? It is simply too limiting. The ‘P’ SKU for example, doesn’t allow AD synchronization via Dirsync, it doesn’t have the provision for email archiving, it is limited to 50 licenses in total, doesn’t include Office Pro Plus, limits the amount of SharePoint storage and so on. To my mind the biggest appeal of Office365 for end users is going to be the version of Office Pro Plus they can download and install on their machines. Another major point is the fact that Office 2003 will not be supported. This means Outlook 2003 won’t even be able to connect to Exchange Online under Office365. Given that Office 2003 is approaching almost 10 years I really think it is time people upgrade to Office 2010, but something to be aware of when doing migrations. Interestingly, Office365 passwords can be 7 to 16 characters in length. We asked why there is an upper limit but no one seemed to know. This is sort of a bummer as many have been schooling customers to use pass phrases or more than 16 characters. Hopefully that will change before Office365 goes public. As for the SharePoint stuff well there wasn’t too much I hadn’t already seen already having access to the beta. However, there were plenty of interesting questions thrown up by attendees which adds to the knowledge base. So, was it worthwhile to take 3 days out of my business to learn about Office365? Definitely. Will I have to do more research and testing? Yes, but I happy to do this as I see Office365 being big and there are not many people out there with the skills, especially in the SBS world. Much of the information I learn about Office365 will find its way into my Cloud Guide (currently part of my SharePoint Guide). As Office365 grows so too will this information but focused on the SME market. Finally, please remember that everything I mention here is still about a product that is yet to be released and is subject to change. However, I am really liking what I see and can’t wait to start tying it into SBS 2011 Essentials for starters. So the focus of today’s training was all around Microsoft hosted Exchange. It can get pretty complex for people who want to maintain a hybrid configuration. Unfortunately, it seems that SBS configurations are going to be difficult. Why? Well, most SMB customers have some very large email boxes. This makes a migration completely to the cloud tricky over Australian broadband links. Don’t forget that the ‘A’ in ADSL stands for asynchronous – meaning the speed up to the Internet is generally MUCH slower than the speed down from the Internet. If the email is going to the cloud (i.e. during a migration) it is going UP at the slower speed. Given gigabyte sized mailboxes this could take quite a while. The problem is that most of the tools don’t allow you to do a staged migration. You can’t generally nominate which mailboxes you wish to transfer, you can’t pause the migration (you can stop and rerun from where it left off I believe), you can’t elect to prioritize current messages and so on. Thus, if you want to move all the mailboxes totally to the cloud (a la SBS 2011 Essentials) you need to be very mindful of the mailboxes sizes and bandwidth limitations. If you decide on a hybrid strategy (i.e. Exchange on site sync’ed to hosted Exchange) well you’re in for another whole world of pain. Firstly, this rules out SBS 2011 Essentials as there is no on site Exchange. Secondly, you need to install the Dirsync tool to synchronise your AD user details to the cloud. Problem is Dirsync is currently only a 32 bit app (64 bit is coming) AND isn’t supported on a domain controller. This rules out a network with a single SBS 2008 or SBS 2011 Standard server since they are both 64 bit and domain controllers. Thus, you’ll need another members server in your network (hello SBS 2011 Add on pack) on which to run this. Oh yes, Dirsync doesn’t sync passwords from onsite to the cloud. Shall I go on? Another option with the hybrid strategy is to use federation services via ADFS v2. Although this does provide more benefits over simple Dirsync (i.e. allows AD security groups to replicate) it again requires client software on a non-member server. Oh yes, it also requires Exchange 2010 on site which rules out SBS 2008 and most existing SBS installs since SBS 2011 Standard (which includes Exchange 2010 onsite) has only just become available. So it would seem that SBS 2011 Essentials is going to be the only domain controller on which cloud syncing tools will be supported on. However, don’t forget that SBS 2011 Essentials is limited to 25 users in total and doesn’t have an upgrade path to SBS 2011 Standard (which would need another member server anyway if was to sync to the cloud). So you are going to have to think real hard about which Windows Server version to use for clients who want to go Office365. But hey, this is no different from in the past right? This is the reason you are the IT Professional, right? This IS the reason your business and skills are not going away with the cloud! Your clients will still need you to advise them. The question I have however is, do YOU have ‘cloud’ skills? Hmmm…? Confused and frustrated? Me too. The cloud stuff ain’t going to be easy on SBS networks. It would seem that the path of least resistance and cost is going to be complete mailbox migration to the cloud. However, you’ll need to probably trim the existing mailbox sizes before migration and keep an eye on bandwidth issues. In this case also you aren’t going to need SBS 2011 Standard unless the customer has more than 25 users or a third party on site app. There are, however, some nice features. Depending on what online license you get, you are entitled to ‘unlimited’ email archiving. There are plenty of powershell commands available to allow you to script and automate processes. Also there is far more granular control over mailboxes and ability to implement retention and archiving policies (depending if your license allows that). You’ll also get Microsoft Forefront security protection on your email which has an improved web interface allowing you to things like white list domains, release trapped emails, troubleshoot issues, and more although we didn’t see that today. There is still lots of stuff I need to digest, research and check here, especially in light of SBS, which I will do, however I’m now looking forward to the SharePoint stuff tomorrow. Another update tomorrow. I’ve just completed the first of three full days of Office365 training. 1. 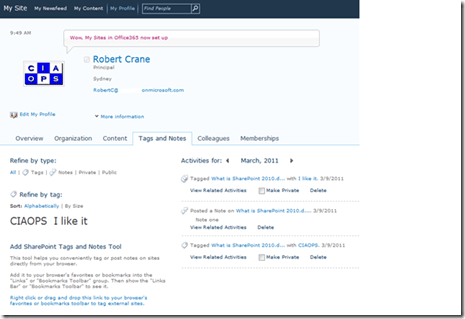 All Office365 users will get read only access to SharePoint docs via Office Web Apps. If they want to edit then they need the appropriate SKU. 2. Office365 is ‘highly configurable not customizable’. This means there are limits to what can be done on the admin side. 3. If you purchase a license that includes Office Pro Plus on the desktop you can install that on 5 devices. Very generous. Beware, though this is a special SKU more like retail than volume licensing. There are also NO downgrade rights with this version of Office. 4. Dirsync runs every 3 hours by default but can be manually run if needed, however it is a one way sync from local AD to cloud and the application MUST NOT run on a domain controller. It is also still a 32 bit app (64 bit is coming). I’m looking forward to more technical in depth training tomorrow as today was billed as more of an ‘overview’. After the third day I feel I’ll be very much up to speed with Office365. Best of all we get our own full beta version for testing. I have an SBS 2011 Essentials RC machine here that is just crying out for Office365 integration. More updates tomorrow. Follow me on Twitter (@directorcia) as I’ll be posting interesting info from the training day there. I thought I do a series of posts on why Office365 is such a great option, especially for small businesses. So let’s start with my favourite – SharePoint. In the current Microsoft Online offering (BPOS) SharePoint is effectively only Windows SharePoint Services v3.0 but in Office365 it is upgraded to SharePoint Server 2010 Enterprise. That is a HUGE step up in functionality for effectively the same price. SharePoint Server 2010 Enterprise costs big bucks and is normally only seen in use with very large corporations, but now with Office365 even a single man business can access these Enterprise tools. 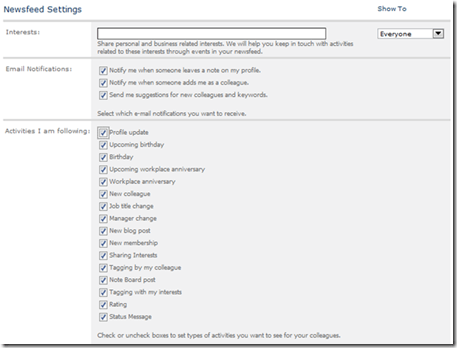 One of the first big bonuses with SharePoint Server over SharePoint Services is the inclusion of My Sites. Think of it like Facebook for the Enterprise (functionality-wise I mean. Perhaps Linkedin is a better analogy for those that know Linkedin). 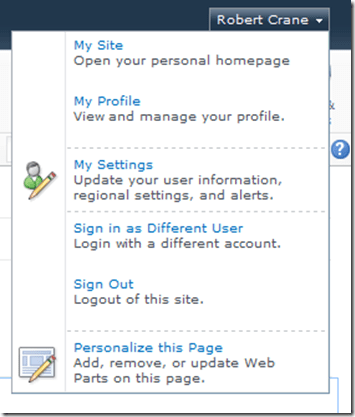 You access it from the top right of the SharePoint screen under then menu for your name as shown above. My Sites is actually a full blown SharePoint site dedicated individually to each user. In here people can track others, save documents, share documents, keep track of what they are working on in the main SharePoint Portal, and so much more. As you can see from the above screen shot you can keep track of your Colleagues, Interest and Newsfeed (very ‘Facebookie’). As you can see from the above shot your My Site is a fully blown SharePoint site that you control. Each Office365 user has the full power of SharePoint Server 2010 at their disposal in their own personal area. The above screen shot gives you and idea of the information you can aggregate in you My Site. Here we are looking at all my Tags and Notes across the portal sites I have access to. I can easily set information about myself that helps others in my business understand what skills I have. Likewise, I can easily find others with the right skills to help me with my job. I can select and track the work that other individuals in my team. In this way you can see exactly what other have been working on across SharePoint quickly and easily. Here’s some example of what Newsfeed Activities I can elect to follow. As you can see it is pretty extensive and would be exceptionally beneficial to any team. It makes tracking what changes in SharePoint quick and easy which can be important as SharePoint grows. So the first major benefit of SharePoint in Office365 is the My Sites functionality. I’ll be detailing more in coming post so you can understand why it is such a major upgrade and one that should seriously be considered by ALL organizations. Yeah! I passed the Microsoft Exam 70-169 – Windows Small Business Server 2011 Standard, Configuring and here’s my badge to prove it! I wonder whether they’ll be having a separate one for SBS 2011 Essentials? I would assume they’ll be having them for Office365 (although there was none for BPOS to my knowledge)? I need to get around to doing the SharePoint 2010 exams as well so always plenty more qualifications to work towards. Never hurts to keep your skills updated. The latest episode features Josh Peterson from Taylor Business Group speaking firstly about the importance of having a well structured Profit and Loss chart of accounts. Without this you will struggle to obtain meaningful performance information from your business. Josh also shares the key ratios you should be obtaining fro your business. He then discusses the benefits of business improvement groups and how they can help take your business to the next level. This day is filling fast so you if you are thinking of attending then I’d sign up up soon to reserve your place. You can do that via http://www.ciaops.com/bootcamp. Remember, as soon as you sign up you will receive access to my SharePoint Operation Guide until May 2012. I’ll also be promoting this event as much as possible through social media. As such I have decided on the Twitter hash tag #ciaboot. I’d also encourage people to go to the SharePoint Guide Facebook page at http://www.facebook.com/wssops, follow the event and start a discussion about you’d like to see covered on the day. The bootcamp is also confirmed for Sydney but still tentative for Brisbane so if you are interested please register. I’ve been a good boy and not abused my YouTube privileges. My reward is now the ability to upload video of more than 15 minutes. Stay tunes for my first full featured YouTube “movie”.